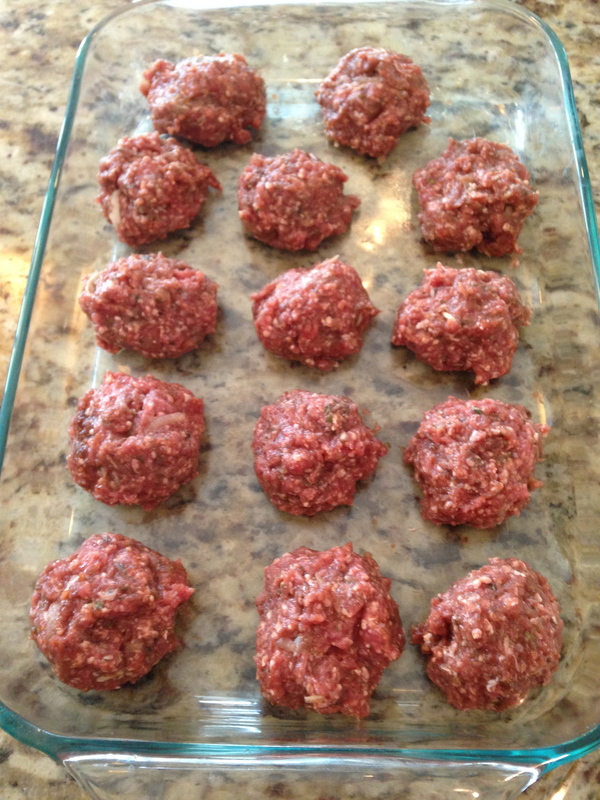 Homemade (Paleo friendly) Kibbeh balls - Real Food. Real Fitness. I’ll admit I never ate much lamb growing up. It was not until I met my husband that I was truly introduced to this delicious meat. My husband is Lebanese and a traditional staple Lebanese food is Kibbeh or lamb mixed with spices. It can be eaten raw (from good sources) or cooked and there are many different ways to prepare it. There are also the more familiar lamb dishes such as rack of lamb, chops or stew. Grass fed lamb contains valuable amounts of CLA or conjugated linoleic acid which is associated with reduced inflammation and (BONUS!) reduced body fat! Grass fed lamb is a very good source of selenium, zinc, vitamin B12, B1,B2,B6, folate and choline which are important to a healthy metabolism. Grass fed Lamb has a virtually non-existent carb content. This may help with blood sugar regulation when consuming lamb with other foods. Bottom line: Lamb is awesome! And a great alternative to grass fed beef! 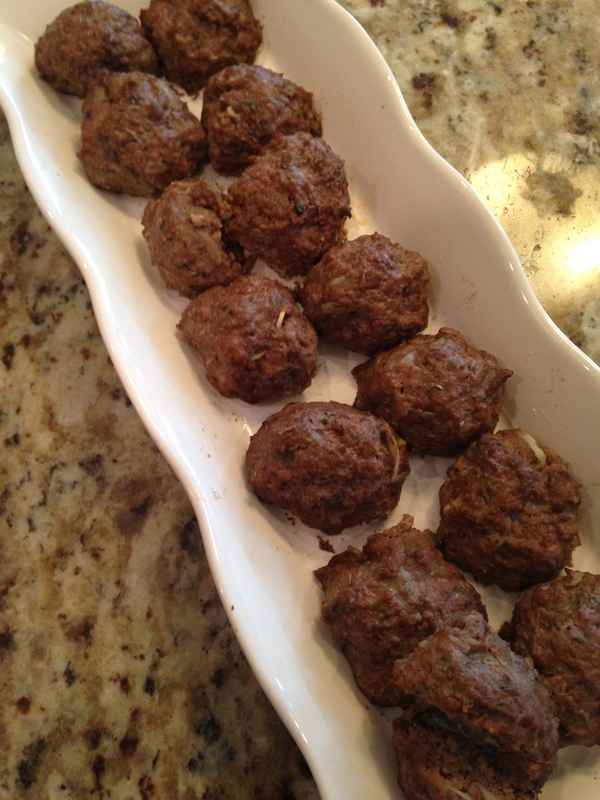 Here is my recipe for homemade Kibbeh (lamb) balls – PALEO FRIENDLY! Mix everything together in a bowl. I use my hands as this is the easiest way to get all the spices combined. Roll into balls and place in glass baking dish. Bake at 350 for around 30 min (do not overcook). I serve these with hummus and taboulli salad and a side of Leban (Lebanese yogurt). I love kibbeh, my husband is Lebanese too and I am American. I’ve been gluten free for a while and had been paleo until I moved to Lebanon permanently. It’s so difficult to be fully paleo these days, I only cook Lebanese food but I always create gluten free Lebanese meals and just eat low-carb which seems to be ok for my body for now. I had never thought of just not putting any bulgar substitute, I use either rice or cauliflower. I’ll try it your way next time, looks great!! Yes most recipes and foods can be adapted to Paleo. Lebanese food is tricky with bread, garbanzo beans, and the bulgar in many recipes but I just opt out of using those or find a healthier replacement. Cabbage rolls I use no rice and just lamb and pine nuts as the filler and they are amazing! Green beans and lamb stew is another favorite of ours that can be completely paleo! Great to hear your feedback! Great recipe! I am Lebanese and try to eat Paleo as much as possible…I make a variation of this called Shish Kofta…basically the same thing but molded around skewers and then grilled. Yummy. Sounds Delish Allison, thanks for sharing!! !